In Western Christianity, most people celebrate the Messiah’s birth on the 25th of December. Eastern Christians celebrate it in early January. But can we historically and Biblically verify these winter dates to be correct? The answer is no, we cannot. Traditions easily slip into the faith of even the most careful of individuals – none are immune to its potential presence. It is when those traditions override the Word and its revealed details that problems arise. The matter of the timing of Messiah’s birth is one such area where tradition has firmly entrenched itself in so many of the faithful, that it comes to be seen as a loss of great meaning when the realities of the matter are brought forth. People might say 'Why does it matter when Messiah was born, only that He was indeed born?' However, if Scripture has preserved the details for us to land upon a correct date, then it can be argued that it does matter when. In this study, you will see that the when is indeed contained in the Word, and when the when is rightly seen, the importance of the why will be illuminated for us all. The study begins in the New Testament book of Luke. Although Luke was not present for the ministry of Messiah in Israel, he took great effort in interviewing those who were, and who knew Yeshua’s family history, so that the reader of his Gospel account is presented with many interesting details that are not always present in the other accounts of Messiah’s ministry. He took particular time and space to relate to us the story of Z’karYa (Zacharias) and Elishba (Elisabeth), the parents of Yukhanan (John) the baptizer. It is in the details of that account that the ability to zero-in on the timing of Messiah’s birth begin to be uncovered. 5 It was in the days of Herades, king of Yihuda, that there was a certain priest named Z’karYa, from the ministry of the House of AbiYa, and his wife was a daughter of Ahrun; her name was Elishba. 6 Yet, the two of them were righteous before the Deity, and they were walking in all the commandments and in all the uprightness of MarYa with no fault. 7 Yet a son they did not have, because of Elishba’s barrenness, and the two were many in days. 9 in the custom of the priesthood, it came to him to place the incense, and enter into the Temple of MarYa. Z’karYa was a Levitical priest who is recorded as serving in the Temple in Jerusalem. 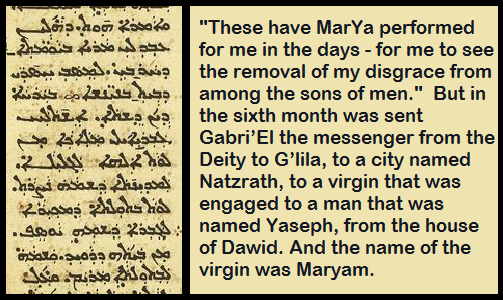 Everyone served in the Temple of MarYa who was of Levitical descent – but they did not serve all year long in their service. Each had the ability to serve just a short time each year. There were so many Levites that they had to operate on a rotating schedule. In the time of David he had invoked a system dividing the priestly families into twenty-four groups chosen by lot to serve. This enabled the Temple service to function all year long with different priests officiating when their order arose. The interested reader can view the account of the divisions of the priesthood in the book of 1st Chronicles 24:7-19. The details of this account give us validation for the passing comment in Luke 1:5 that tells us Z’karYa was part of the house of Abijah (AbiYa). The account tells us that the course of Abijah was the eighth course of the year. Out of the twenty-four priestly courses or “houses,” Abijah was the eighth, which means that his service was more towards the beginning of the Biblical year. Now, the Father commanded all the males of Israel to go up to Jerusalem yearly on three feasts, as seen in the book of Deuteronomy 16:16. The Biblical calendar begins in the month of Aviv (normally starts in our April). With the Biblical calendar the courses repeated twice with the 24 groups within one year’s time. This schedule covered slightly over 354 days a year, with the three added times when all went to Jerusalem for the special pilgrimage feasts, thus filling the Biblical year fully. Unleavened Bread is a spring feast, and Weeks is a beginning of the summer feast. Tabernacles is the last of the Scriptural fall feasts. What does this tell us? It shows us that Z’karYa would have been serving in his allotment around the month of June in a Gregorian year. This is important because it enables us to place a very solid date into the matter of the question of the timing of Messiah’s birth. 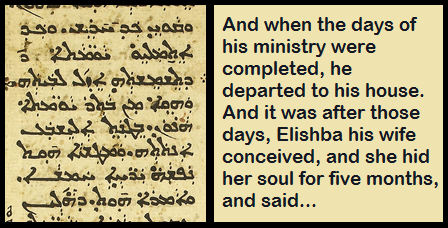 This detail shows us that John the baptizer was conceived after Z’karYa’s ministry. After his service was complete, Z’karYa returned home and his wife conceived his son towards the end of the third Biblical month. Accounting for a full-term pregnancy, this places the birth of John the baptizer at the time of the spring feast of Passover. This factor is especially interesting in that Messiah specifically said in Matthew 11:14 that John was the fulfillment of the coming of Elijah, echoing the declaration of Gabriel to Z’karYa in Luke 1:17 that John would come in the spirit and power of Elijah. Why is this interesting? It is interesting because Judaism has long associated the Passover feast as the time when Elijah the prophet would come again! Even to this day, the Passover table and order include the mention and hope of the return of that prophet. Thus, the timing of John’s birth at Passover syncs with his purpose to act in the power of Elijah just as Judaism understood Elijah to come at Passover! A more pointed reason why the timing of the conception of John is so important is because it is necessary information that sets the stage for correctly determining Yeshua’s conception and birth. According to Luke 1:25-27, Yeshua was conceived six months into Elisabeth’s pregnancy. The angel Gabriel then explains in Luke 1:36 that Elisabeth is in the sixth month of her pregnancy. These details show that Yeshua the Messiah was born 6 months after the first month when John was born at the time of Passover (April). This means He was born in the 7th Biblical month during the Biblical pilgrimage time of the Feast of Tabernacles! The Torah speaks of the feast of Tabernacles, among other places, in Leviticus 23:39-44, and tells us it is a joyous time. The feast of Tabernacles is the most joy-filled time of the Biblical year. Worship is incredibly intense throughout Jerusalem, and rejoicing in food and drink is a prominently-fulfilled commandment. Messiah would thus have been born at this very wonderful time around late September / early October of the year, not in December. Additionally, if we backtrack 10 months from Tabernacles, He would have been conceived in the womb of Mary at about the time of the Jewish festival of lights known as Chanukah, as the Light of the world! This means if you celebrate Yeshua during the month of December you are actually celebrating the time of His conception, and not His birth! Yet another detail in Scripture shows us that His birth would have been in the fall around the Gregorian months of September / October. This detail revolves around the timing of His death, the length of His ministry, and His age when He began ministering in Israel. We know that Messiah was crucified at Passover, which means in the spring, around April. It is also generally assumed that the timespan of His ministry as recorded in the Gospels was about three and one half years long, based off when He began to teach and the references to Passovers and other events. Finally, we know that He began His ministry at the age of thirty (Luke 3:23). Scripture tells us that Levitical priests began serving at the same age (Numbers 4:1-3). Yeshua is a priest according to a different priesthood, of course, but the Levitical is patterned after the priesthood of Melchisidek. It would make perfect sense for Yeshua to have begun His ministry at the time of His 30th birthday, just as would the priests in the Temple begin their ministry at the same time. What this reveals for us is that noting that He died at Passover, and returning three and one half years into the past, it places the beginning of His ministry at age 30 in the fall, around September / October, which again aligns perfectly with the other Scriptural details of the timing of His birth! A detail from Luke 2:10 also further points to the timing of Yeshua’s birth as that of the feast of Tabernacles in the fall of the year. The angel tells the shepherds that they bring news of “great joy.” The feast of Tabernacles has been known for ages in Judaism by the reference ZEMAN SIMCHATEYNU – “The time of our Joy.” Joy is commanded to be a part of the feast, as Leviticus 23:40 and Deuteronomy 16:13-15 tells us. Indeed, part of the mystique of the nativity story is the coming to Bethlehem of Yeshua’s mother and step-father, His birth in a manger, and the joyous announcement to the shepherds. While the story is romanticized and colored with the warmth of tradition, the Word has some truly beautiful things to tell us about the matter that are worth taking time to look into to appreciate what really happened. The event is prophesied in the book of Micah 5:1. What is important about Migdal Edar? It literally means “Watchtower of the Flock.” Depending on what version of the Bible you may be using, the translators might have the Hebrew name transliterated, or they may have the translation given above. What is important to take away from this is that it is a place name. But it is not the place name for just any mundane shepherding locale. Neither is it just any flock, for the ancient Jewish historical work known as the Mishnah, in Shekalim 7:4, tells us something about the vicinity of this place that is entirely worth knowing. If an animal that fit sacrificial-species requirements was found loose anywhere from Jerusalem up to Migdal Eder at Bethlehem, the rule of law in Israel was that the animal must be viewed as being intended for a sacrifice. Even if the animal was not in reality originally designated for such, if it were found wandering without an owner, it was viewed as having been destined for a worship experience at one time, and had to be thereafter treated as if it were intended for such. What this did was prevent any person from accidentally using an animal intended for holy worship in a mundane manner, for to do such would be a blasphemous act. It therefore protected anyone from accidentally erring in a horrible manner against a potential sacrifice to the Holy One. How does this detail from the Mishnah fit into the birthplace of the Messiah? It shows us that the area was designated as a place where sacrificial animals were bred and reared. The Temple in Jerusalem was just some five miles away, and beyond the sacrifices worshippers would bring for their peculiar sins, or the sacrifices made as peace offerings, the Holy One Himself required daily sacrifices from the priests, as well as monthly, and even special ones for the seven yearly feasts. This requirement of constant sacrifice necessitated that a source of sacrifice-worthy sheep, goats, and cattle would be available at moment’s notice. The herds and flocks of these Temple-destined animals were kept nearby. Since Jerusalem itself is a metropolitan area, even during Biblical times, the pastoral land around nearby Bethlehem served as the ideal place to keep those animals of holy purpose. Thus, we have the location of Migdal Eder – the Watchtower of the Flock – the site which overlooked the pastures around Bethlehem upon which grazed the animals whose sacrificial future ensured the Israelites would have a peaceful future. This place as the Temple-source for animals also makes complete sense of another law of first century Israel recorded also in the Mishnah, in Baba Qamma 7:7, which tells us a surprising detail. The severe law against having any flocks of sacrificial-suitability in any place other than a distinctly wilderness area in Israel presents for us the curious notion that the presence of shepherds and flocks around Bethlehem and so close to Jerusalem meant that they were not your typical herds at all, and neither were these shepherds your typical shepherds. They could not have legally been pastured in that area according to the laws of first century Israel – unless they were not ordinary herdsmen and flocks at all, but were there precisely for the Temple! Therefore, Migdal Eder is seen to have been the place where the flocks could be watched over which would end up being slaughtered for sins. The Temple shepherds watched the flocks, and they would keep them out in the fields all the time, except when the ewes were ready to give birth. For the birthing process, they would bring the ewe into the stables of the watchtower, into a stall that was ritually clean, so that the lamb to be born would be born into an environment of cleanliness and with the least possible chance of obtaining a blemish that would render it unsuitable for later sacrifice. ​All of this speaks directly to the birthplace of Yeshua, in that Micah 4:8 says the kingdom would come to Migdal Eder. How are we supposed to understand that verse? 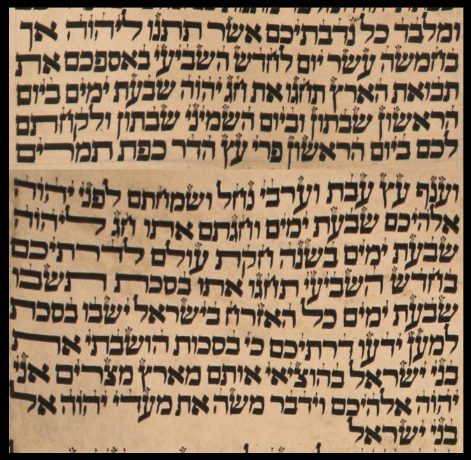 Well, if we resort to the ancient Aramaic translation of the Torah known as the Targum Yonatan, it preserves there an ancient Jewish view about Migdal Eder and the Messiah that helps to clarify things for us. In the place where the Targum paraphrases Genesis 35:21, which speaks of Jacob moving on to Bethlehem after the death of Rachel, we read that the commentators of antiquity viewed Migdal Eder as the place where the Messiah would actually be revealed!! In understanding Micah 4:8 that it was the Messiah who would come to Migdal Edar, the announcement of the angels to the shepherds finally and at long last makes total logical sense. They announced the birth of the Messiah to shepherds at the very place that the nation had supposed the Messiah would be revealed. It is a beautiful thing that the Father did for His people and for His Son. It was not to just any stable to which Joseph and Mary went for her to give birth. No, it was directly to a clean place: to Migdal Eder! The shepherds would have immediately known to go look at that familiar and obvious place. It was not to a baby in a stable, but to a baby in a stable trough for which they sought. If it were not so, then the Bible presents us with the angels giving an incredibly generic piece of information to the shepherds on how to find the newborn King. In a town filled to capacity with pilgrims due to both the Roman census and the Biblical feast of Tabernacles, it would have been an arduous and disruptive task to go from house to house waking the inhabitants and asking to look in all the stables for a baby. Yet, if the announcement is viewed in terms of the prophetic detail all Israel hoped was to come to pass, then it makes perfect sense that the angels did not include the specific “where” of the matter – it would have been blatantly obvious to the shepherds – the baby would be found in a feeding trough at Migdal Eder! ​Another beautiful truth emerges in these details, too: Mary was not in a nasty stall or dank cave with filthy animals around her, but in a warm place that was ritually clean, and attended-to by shepherds trained to help the flocks give birth. The Holy One did not leave this chosen and blessed woman to give birth to the King of the world in a place of poverty, but rather He sent her to the location that directly fulfilled prophecy, where the lambs that would be sacrificed were to be born – so that His Lamb could be born in safety. This special time can be celebrated where we commemorate the birth of the Redeemer for eight full days of joy and intense rejoicing. It is important for us to do this, because it serves as a rehearsal for when Yeshua returns to earth to reign in Israel. Take a careful look at the book of Zechariah 14:16-21. This prophetic passage tells us that when Yeshua returns to this earth to rule as King from Zion, part of His reign will involve having representatives or peoples from every nation come up to Jerusalem every year during the time of the Biblical feast of Tabernacles, and if any disobeys, then no rain shall fall upon their land. Knowing that the feast of Tabernacles is the time frame of His birth, it looks like He will desire the nations to observe His birthday during the true time frame in which He was sent to this earth. We can get on board with Him now and rejoice for the Father sending His only begotten Son to lead us forth from sin and death into an abundant new life!